I think I’m writing this post as a reminder for me more than anyone else. TV has always seemed to have it’s hold on our lives. It entertains my kids when I need to get things done. It entertains us when we’re bored. It’s just ALWAYS there like a friend beckoning to us to ‘come and play’, only this friend doesn’t always have the best influence on our kids and on our family. If you’re like me, sometimes the ‘2 hours a day’ rule turns into 3 or 4 or even more! It can be so nice to have my children quietly entertained while I get things done. On the other hand, what price will I have to pay for that extra quiet time? I have noticed that even though tv entertains my kids, too much of it causes contention in my home. My children fight more and don’t get a long. Well, I’m not a professional child psychologist, but here is what I see. When my kids are watching too much tv, they are not interacting with each other and learning how to get a long. When they are watching mundane sitcoms or shows that,while not bad, do not uplift, inspire or teach, they are wasting their time and not learning life lessons. Make TV work for us, rather than the other way around! A TV is an appliance, and just like any other appliance in my house, it needs to be our servant, not our master. It should be used in balance with all other good pursuits in our lives and should uplift, inspire and help teach us to be better. Ditch the antenna and tv channels. I know that there is wonderful shows on normal tv channels or cable, especially. Here’s the thing though. Most local channels have commercials, and I have found that the world is getting to a point that the commercials are not family friendly most times. What’s the point in watching an uplifting program with my kids if I have to tell them to shut their eyes or turn off the tv during a commercial? (Carl’s Jr. especially is famous for their horrible commercials.) We used to have a HULU subscription because the commercials were short and usually just corny rather than inappropriate. Such is not the case anymore and I have canceled our subscription. Netflix. Netflix can be good or bad depending on how you use it. We have chosen to keep Netflix because of the huge selection they have of family friendly shows and Christian movies. They also give you the ability to set your parental controls. While it is still not the perfect set-up, we make it work for us. We have chosen, as a family, the shows that we feel match our family values, and added them to the “YOUR LIST’ section on Netflix. If my kids want to watch something that is not on our list, we talk about it and evaluate if it we should add it. Also, my favorite part about Netflix is NO COMMERCIALS!! Roku. I love Roku for several reasons. I can add ONLY the channels I want for our family, and set a pass code so that no one can install any new channels without it. Also, Roku has some more family friendly channels that other streaming devices do not. I am a “Mormon” and I absolutely love The Mormon Channel because it is overflowing with wonderful family commercials, shows, and even a 24/7 uplifting music station that brings a great feeling into our home! Here is a list of other religious channels on Roku and here is a list of their kids and family channels. We have also used the Feel’n channel because I love the Hallmark hall of fame movies and they have a huge selection of them, (but not ALL of their shows are family friendly so use with caution) *disclaimer: I have not reviewed all of the roku channels, I only give you links to these lists for your reference. Use your own discretion in deciding what is appropriate for your family! Amazon. (also available on Roku) We also like Amazon because they also have great parental controls and we like to purchase great digital versions of our favorite shows from them and have access to them on our account without having to worry about our kids scratching dvd’s. Here are some of the things I have purchased: Bill Nye, Leap Frog, Liberty’s Kids, & Magic School bus. VidAngel. This is something I recently discovered and I’m really excited about it! Don’t you just hate it when a great movie comes out, but you can’t watch it with your family because of that ONE scene or the language or violence? It could be a very inspirational movie, but unwatchable because of inappropriate “additions” that Hollywood decided to add. VidAngel not only makes it possible for you to watch movies from the comfort of your own home (no more redbox returns!! ), they also give you the opportunity to edit out any scenes, language, or violence before you purchase it. You can watch VidAngel on Roku, Apple TV, or Chromecast. I hope if you are reading this and you have ideas that I haven’t shared, that you will comment and share! I would LOVE to hear more ideas and I’m sure other parents would too! 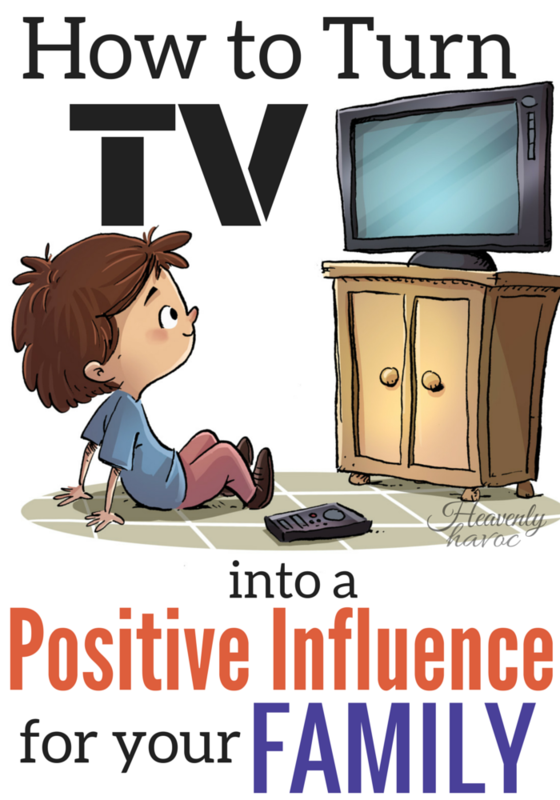 Best of luck in making TV a positive influence in your home!